Robert E. Murray, chairman, president and CEO of Murray Energy Corp., recently said the company uses two longwall machines in the Marshall County Mine. Prior to Murray’s 2013 acquisition, this operation ran as Consol Energy’s McElroy Mine. In 2011, employees at the mine produced 3.99 tons of coal for every hour worked, MSHA data show. By 2016, the number jumped to 6.35 tons of coal for every hour worked. Let’s state those numbers differently: In 2011, it took 25 workers one hour to produce 100 tons of coal (25.06 workers to be precise) but by 2016, it took less than 16 workers (15.75) to produce the same 100 tons. In just five years, increased automation allowed Murray Energy to produce the same amount of coal with 37% fewer workers. 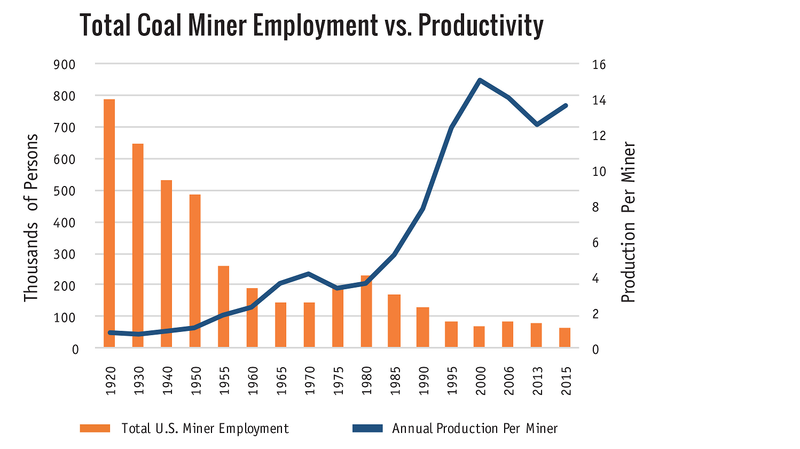 And a recent study by the International Institute for Sustainable Development and the Columbia Center on Sustainable Investment predicted that automation was likely to replace 40 to 80 percent of workers at mines.